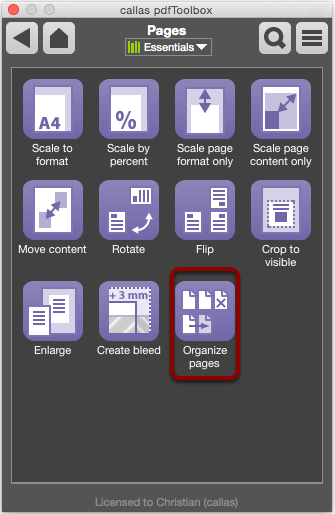 The Organize Pages action is a flexible and easy-to-use tool for rearranging (moving, deleting, duplicating or selecting just a few) pages within a multi-page PDF file. 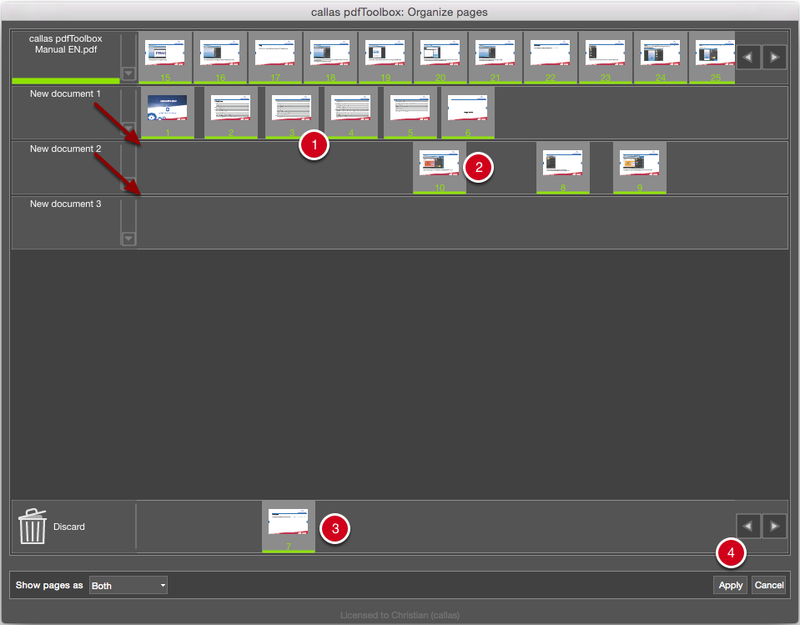 It is even possible to move or copy pages from one PDF into another. We’ll show you how you can use this tool. The Organize Pages action can be found in the Switchboard under the Pages group. The Organize Pages window provides a brief description of the action. 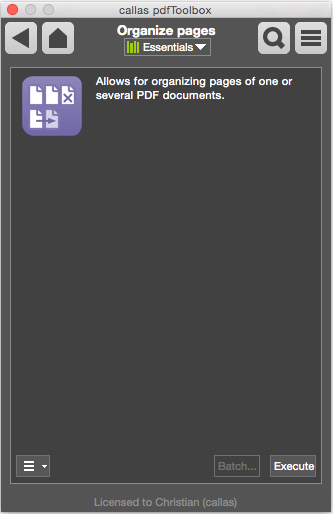 In pdfToolbox Standalone you will find an Organize Pages entry as well in the Tools menu or you use the keyboard shortcut (Win: CMD+Shift+M, Mac: Strg+Shift+M). Tip: As reorganizing pages may also alter the original document in some cases, it may be necessary to work with a duplicate if it is essential to leave the source file in its original state. Otherwise, when saving the new document, you will need to make sure that the original is not saved. The top part of the Organize Pages window shows all pages within the open document in a row. For documents with large numbers of pages, you can use the arrows on the right to adjust the previewed pages shown. The type of page view can be configured using a pull-down menu in the lower-right corner: Miniatures, Page Counts or Both. Below the row of pages in the original document, you will see an initially empty row to which you can drag selected pages. This area will initially be given the name New Document 1 (this name can be changed when you save the document). Below, there is a row labeled Remove where you can place pages to be removed. At the very bottom right, you will find buttons to Apply the changes or Cancel the action. 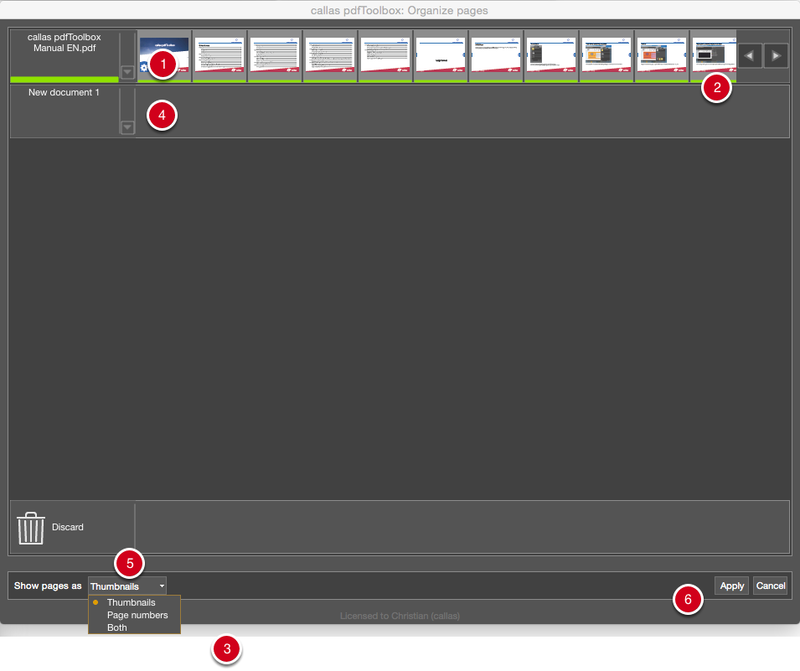 User-defined page arrangement for a new PDF document (or, as seen here, for multiple new documents) is a very intuitive process. We have chosen the Both view here for a clearer picture of the process. When the desired pages are moved to the New Document 1 row, a new row is automatically created (New Document 2, and so on.) A new empty row will always be provided at the end of the list; if all pages are removed from a row, this row will be hidden. Tip: You can duplicate pages by holding the Alt key and dragging them. Pages to be deleted can be moved to the Remove row. New Document 1 with the selected pages in the desired order. New Document 2 with the selected pages in the desired order. At the bottom of the window, you can see that the file has been altered. 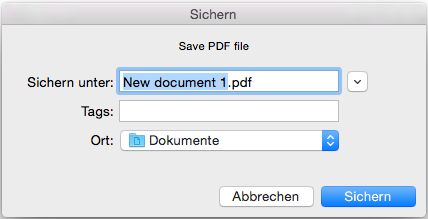 You can then save the new document(s) under a new name. Note: Do not save the original document when closing the window if you want to keep it in its original form.